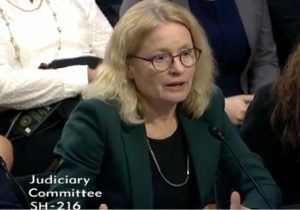 Georgetown Professor of Law Lisa Heinzerling has always been a fresh voice in defending workplace, environmental and consumer protections against the onslaught of complaints from Republicans and the business community about allegedly job-killing regulations. So in an otherwise depressing week listening to Brett Kavanaugh’s confirmation hearing, it was a breath of fresh air to hear Dr. Heinzerling testify against Kavanaugh’s nomination. The touchstone of Judge Kavanaugh’s work as a judge is the separation of powers, and the motivating force behind his focus on the separation of powers is the protection of liberty. Unfortunately, however, the “liberty” Judge Kavanaugh embraces is badly skewed, and terribly small: it is the liberty of powerful groups to do their business unhindered by government, rather than the liberty that comes from meaningful government protections against harmful human behavior. In the name of “liberty,” Judge Kavanaugh has rejected rules addressing toxic air pollution, climate change, workplace safety, financial fraud, and more – without acknowledging that in such cases, “liberty” sits on both sides of the legal question. There is, on one side, the liberty of regulated groups to go about their business unimpeded by federal law. There is, on the other, the liberty of the rest of us to go about our lives – at home, at school, at work, and in our communities – with a reasonable assurance that the government has our back in protecting us against coming to harm at other people’s hands. You can read her entire testimony here, and listen to her testimony, followed by her well-informed responses to the Senators’ questions, here (starting at around 6:15).